Bernhard Schreiber was born in 1942 in Stuttgart after his father died in action as an officer of the Luftwaffe. His investigations into the Holocaust led him to discover that many of the guiding principles of the Nazis had global appeal, both before and after World War II. 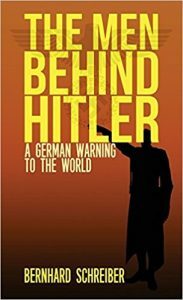 Disturbed by the success of the new strategies pursued by proponents of eugenics, euthanasia, and population control, especially (but not exclusively) in the field of psychiatry, Schreiber decided he needed to distribute the findings of his research, which he did around 1974 in a book he called, “The Men Behind Hitler: A German Warning to the World.” This is a reprint of Schreiber’s book created directly from a physical copy of his book as a reference.